If you have a smartphone, then you are probably familiar with voice search using Siri, Google Now, or Cortana. 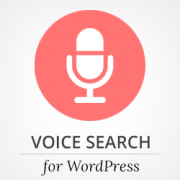 Wouldn’t it be nice if you can bring voice search functionality to your WordPress site? In this article, we will show you how to add voice search in WordPress. First thing you need to do is install and activate the Voice Search plugin. Upon activation, this plugin works out of the box, and there are no special settings for you to configure. All you need to do is go to the Appearance » Widgets section in your admin area. Next, add the default WordPress search widget to a sidebar. If you already have a search widget added to your sidebar, then you don’t need to do anything. Simply visit your website, and you will be able to see a microphone icon in the WordPress search box. When a user click on the microphone icon, it will display the text ‘Start Talking’ and users can say the words they want to search for. How Does Voice Search Plugin Work in WordPress? The Voice Search plugin uses the web speech API to take the voice input. Currently the plugin only works on Safari and Chrome web browsers for mobile and desktop. *Firefox is expected to have web speech implemented soon. We hope this article helped you add voice search to your WordPress site. You may also want to check out our guide on how to add WordPress widgets in accessibility mode. Thanks for writing about the Voice Search plugin! Support for Google custom search and SearchWP definitely sounds interesting and I’m sure I can implement that in the next version. Thanks for writing and sharing this useful plugin with the community.